A local Garland may not have secured garlands in Europe recently, but it hasn’t halted this master cyclist from pursuing a sport which continues to keep him pushing himself (and his bike) to the limit. JON RAWLINSON explains. The French and Germans take their bike races very seriously. But could their desire to win lead to a conspiracy intended to halt foreign riders in their tracks? Franklin local, Murray Garland, thinks not, but he does pause to consider my theory. “My time trial bike took a bit of damage during the flight over [part way on Lufthansa]. I don’t know if that slowed me down but, either way, I had a bad day,” he says of the recent UCI Gran Fondo World Champs’ time trial in the South of France. “There were lots of German riders, now you mention it, and a lot of competitors who flew with Air France found that their bikes turned up days later than they should have. So, maybe there is something in that,” he laughs. Unfortunately, as time trial bikes (in particular) are finely engineered machines, often effectively made to measure their riders, saddling up on a new mount soon before the starter’s gun just wasn’t an option. Illness before leaving New Zealand also hampered Murray’s preparations; a dose of the flu was followed by a stomach bug which (ironically) almost saw him out of the ‘running’. Despite all this, Murray carried on regardless, finishing 35th from a field of 60 in his 55-59 age group. “I have high expectations for myself and I’m very competitive so it was disappointing. I had aimed to finish in the top 10,” he says. However, within just a few days, the Counties Manukau Cycling Club rider was back in the saddle to undertake the event’s road race. 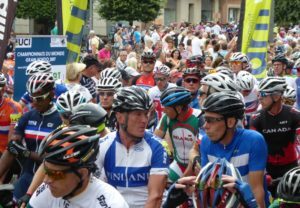 He says the course, which twisted its way through the countryside near the town of Albi, presented the toughest challenge he’s faced in cycling – “by a mile,” or 155 to be exact! During both events it wasn’t just the competition which was running hot; temperatures reached into the high 30s Celsius. What’s more, with both heart and legs pumping hard, Murray’s resolve was put to the test during some tough climbs. Having undertaken plenty of races in the relatively short time he has been riding competitively – approximately 10 years – this local builder (Signature Homes franchisee, Franklin) says keeping his head was of paramount importance. When cycling across the finishing line Murray says he almost gave the game away for good. With Debbie along for the ride, Murray headed for the Pyrenees to do more cycling. The couple regularly rides recreationally and has more than just a few trips down foreign trails under their belts. “We headed down to the Pyrenees for two days and that was awesome! We took in some of the famous Tour de France climbs while stopping to enjoy the scenery,” Murray says. Even though Murray (most often) rides in individual events, he says he wouldn’t have even made the start line in France if it wasn’t for the support of his home team. It’s all too common for former sporting sorts to hang up their boots, retiring to the couch to ‘consult’ from there. However, after roughly 12 months, former Western Australian rugby rep’, Murray Garland, had had enough of watching his middle-aged belly spread. “I finished up at Karaka [Rugby Club] when I was 42 or 43. Then I got fat; pure and simple! I wasn’t happy with myself so I got on my bike to do something about it,” he explains. “My wife, Debbie, did triathlons so I started riding with her. These days, though, she can’t keep up with me!” He laughs when I suggest that, to maintain marital harmony, I’ll keep his remark off the record. Sorry, Murray, I couldn’t resist! Since then, Murray has proceeded full steam ahead, with wins at the Tour of Northland and Road National Champs, and a silver medal at Auckland’s Masters Games, all this year alone. 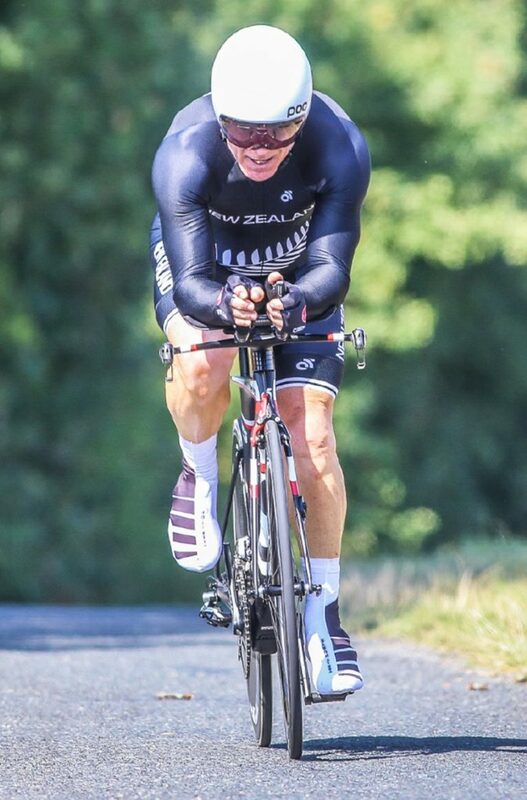 Not the kind of sportsman to let the grass grow under his feat, the intrepid pedlar is currently involved in the six race Dynamo Team Championship series in the Waikato – Sept 24 to Feb 11. Beyond that, he’s getting ready to ride Coromandel’s infamous K2 Cycle Race on October 28; it’s considered one of the Southern Hemisphere’s toughest one-day cycling events. “My goal was to complete it in six hours and I’ve done that for the last three years. Last year, I finished third and, this year, my aim is to win my age group. Preparations are going good,” he says.